More strengthened hand simply equals to more powerful punch. And we all know the importance of it for boxing and many other martial arts (MMA, kickboxing etc.). Whether you only do boxing training (sparring, punching bag training, punch mitt) or show up for a professional match, you can show way better performance with stronger hands. Strengthened hands also reduce the likelihood of injuries and considering that you can get injured in any second during boxing, that is a huge plus 😉 Below there are amazing methods for how to strengthen hands for boxing and actually some hand strengthening methods, exercises are pretty dangerous for your health and below you will find these as well. Many people use newspapers and punch walls or they punch the heavy bag with bare hands. Exercises like these can seriously hurt your physical health. It seriously jeopardizes well-being of your wrist and you may even dislocate it before you know it. I actually had a wrist injury couple of years ago and I should add that I have very weak wrists. So I even don’t want to think about consequences of punching the heavy bag with bare hands or anything like that. Wrist injuries are actually very common among people who want to strengthen their hands for boxing, MMA or any other martial arts training. And I researched about how these injuries are treated on emedicine (By the way that site has lots of information about it) Let me tell you that it can take a lot of time and money to heal an injured wrist. Ever after treatment you may not be fully recovered or get your full strength back. You can punch the heavy bag with a boxing glove which has proper wrist protection. Because of toughness your knuckles will be affected so your skin will be toughened anyway. That will also increase the bone density and strength of your hands. However your wrist will remain safe. So considering your health I highly suggest you to stay away from dangerous exercises like wall punching. And if you are interested in doing punching bag training have a look at these boxing gloves for heavy bag these will protect your wrists and thanks to their design these will also provide you to punch faster than training type gloves. Obviously you will also need boxing hand wraps for this training. As a side note if a punching bag is not hard enough for you, you can always change its filling material. If your bag is filled with water, you can empty it and fill it with sand or even rice. And you can always choose a punching bag which has harder cover material. There are many hand grip strengthener equipment out there and these equipment increase bone density and grip. Also you will feel that your hands are lighter after couple of sessions. These will also increase the endurance of hands and I might add that many people are lack of good hand endurance. This is why many people have really hard time when they first started doing battle rope training. I witnessed this many times in many boxing gyms. After your hands will be strengthened with hand strengthening exercises, you can spend way more time with battle ropes or any workout which requires hand endurance. And thanks to more endurance you can increase the duration of your session with hand strengthener equipment and push yourself even more. Sure many exercises activate some motor units however according to breakingmsucle and many researches, isometric exercises are best about it and when you do isometric exercises, which involves your hands, surely these will also increase your hand strength. So you can start doing push up with punches on “softer” floors because if it is your first trial I don’t think that you can do it. As you get stronger you can do it on tougher floors and strengthen your hands. I also realized that after I had done many isometric training sessions, my hands started becoming way less sore after boxing training. This is actually a very old method but it works. Just pour raw rice in a bowl and dive your hand in it. While your hand is in the bowl, grab rice and squeeze it as much as you can and then release it. I have not witnessed this in gyms but my sparring friend once told me that some boxing, MMA and Muay Thai gyms have it. I actually made a quick research recently and many sites, people on forums also claim the same thing. I personally use hand strengthener equipment because I just like to know how much I improve it. However apparently there are also people who prefer old methods. According to researches on webmd, rice method improves hand strength and even though you don’t understand whether you show some progress or not I am sure that this method can help you strengthen your hands, so I think that you can give it a shot. 5. Just do regular exercises, weightlifting etc. Regular exercises, which require strong grips like battle ropes, dead-lifts, help you have better grip and provides denser bones. Thanks to these exercises you can also get better grip, stronger wrists and forearms in the process. These will also condition your muscles which are close to your hand. Your muscles, which are close to your hand, will have more endurance and be stronger. So while you are doing exercises for strengthening your hand you won’t have sore forearm or wrist. Because when you do hand strengthening exercises, which require your forearm to work, you may even stop because of your sore forearm. This happened to me more than I can count. Doing exercises, which require your hands to work, will benefit your hand strength directly and indirectly as well. How do bones get dense? In this writing I talked about denser bones. So how does this happen? Basically when you punch your bones will have deformation and this sends signal to your brain to make these bones stronger. After that if you have enough calcium and necessary minerals these will get denser. 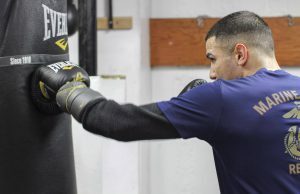 These are all the tips and methods for how to strengthen hands for boxing. Surely these will also improve your punching power and all overall hand performance. You can also have a look at how to punch harder and faster for more tips about the subject. Many people, who do boxing or martial arts training, simply need to condition and have stronger hands. This directly affects your training performance or if you are a professional athlete it will affect you career. When you have stronger hands, this also reduces the risk of injury. This is another important reason why we should have stronger hands. I hope you enjoyed reading and if I miss anything or you have anything to share, please just have a comment below.